For the sake of transparency I should let you know I am a huge William Friedkin fan. Friedkin’s career spans over 5 decades and the American auteur comes from a time when directors not only carved their own successes out but the path for cinema as we know it today. But he isn't just some guy that made some films way back when - his influence is knowingly and sometimes unknowingly evident in many films made to this day and his work is a little closer to home for me as his 1985 neon lit, synth crackling pop infused LA crime film To Live and Die in L.A. is one of my favourite films of all time; with credible and electrifying characters, car chases reminiscent of his French Connection days and still one of the engaging and unpredictable crime stories to make it’s way onto screen as yet. William Friedkin is possibly best known for many of his classics like the gritty French Connection that unleashed Detective James "Popeye" Doyle (Gene Hackman) onto an unsuspecting public, the tale follows the dogged Doyle as he chases down suave European heroin traffickers. The French Connection went on to be the first R-rated film to win an Academy Award for Best Picture, it also won Academy Awards for Gene Hackman (Best Actor), Best Director, Best Film Editing, and Best Adapted Screenplay for Ernest Tidyman amongst other accolades. So influential was The French Connection that it spawned a sequel (French Connection II) a made for TV spin off film (Popeye Doyle) as well as a feature film spinoff based around Roy Schneider’s cop from The French Connection (The Seven-Ups). The French Connection still holds up in an era awash with procedural police tales and its DNA can be identified in anything police related from TV shows to feature films. Two years after The French Connection Friedkin completely changed direction and pushed the boundaries of decency with The Exorcist, the tale of a young girl possessed by a demon. Said by some to be the scariest film ever made - a title it still holds, some 40 years later on many lists and is often spoken of as one of the best horror films ever made. The Exorcist went on to be the first horror film to be nominated for Best Picture but lost to The Sting of its 10 nominations it won two (Best Sound and Best Adapted Screenplay). His follow up to the horror genre defining The Exorcist again took a completely different direction with the claustrophobic adventure tale Sorcerer or The Wages of Fear as I knew it growing up. Sorcerer follows the misadventures of a bunch of misfit dropouts in the humid jungle of South America. They volunteer to drive a volatile and dangerous cargo across rough terrain. Friedkin later went on to say that he considered Sorcerer to be his finest film and although he was less than complimentary about Roy Schneider’s performance I think it may have been one of Schneider’s greatest screen performances. Despite critical acclaim Sorcerer was avalanched by the release of George Lucas’s Star Wars. This turn unfortunately also signaled a change in Friedkin’s fortunes as his films over the following 3 decades his films continued to shock audiences in varying degrees with his challenging material, polarise critic’s opinion and his non crowd pleasing films never quite reached the box office heights of his 70s output. At the core of all his varied output is the undeniable evidence that William Friedkin is a true maverick with an uncompromising vision always realised on screen and a director with the uncanny ability to draw out absolutely astounding performances from his cast. I mention the above to give some context to the type of Director William Friedkin is and what you can expect from his latest film Killer Joe. Killer Joe was on my very short list of eagerly anticipated films to see this year and it doesn't disappoint - shocking and engaging in equal measure from the sure to be talked about a lot - opening scene. With outstanding performances particularly from Matthew McConaughey who reminds us just how talented he is beyond the rom com drivel he has been putting out - set to an atmospheric soundtrack and in an unashamedly deep fried American location. With Killer Joe Friedkin revisits the seedy side of small town Americana, it could be set down the highway from the claustrophobic and paranoia seeped world of his 2006 feature Bug also based on a play by Tracy Letts, starring the uber talented Ashley Judd and Michael Shannon. But this is a darkly comic mirror universe of; trailer parks, pickup trucks, explosive violence, bad decisions, broken promises, quick fixes, cowboy mafias and diner rest stops where seemingly real life quirks are put under the microscope to shock as well as entertain you through your grimace. 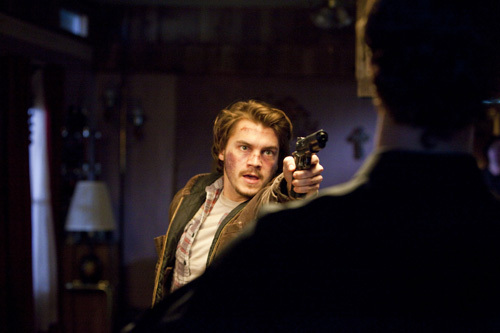 Friedkin’s hallmark tension, and religious undertones runs like a backbone through the film as events start spiraling out of control for Chris Smith (Emile Hirsch) after he coerces his extended family (Juno Temple, Thomas Haden Church and Gina Gershon) into helping scheme the killing of his estranged mother, after she gets rid of his narcotics leaving him in mounting debt. Chris comes up with an ingenious plan to solve all his problems in one foul swoop – enter the mythical Killer Joe (Matthew McConaughey). If this sound a little convoluted - it is intentional as the world of Killer Joe is full of tragically odd and shallow signs of life that could just as easily be propped up on The Jerry Springer Show sofa. In the hands of someone else Killer Joe would probably have morphed into a by the numbers crime tale with added explosions, but Friedkin’s Killer Joe is a pared down, hard knuckle, caravan park, low-rent, neo-noir crime tale of the enigmatic and frankly despicable Killer Joe (Matthew McConaughey). It keeps the audience guessing with McConaughey brilliantly playing against type. 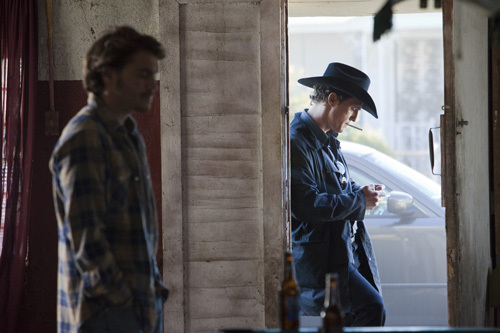 You have never seen Matthew McConaughey like this before and I have to say – his is, a brave performance, certainly one of his best and I would be surprised if he doesn't win or at least get nominated for loads of awards recognising his Killer Joe performance – he is electric as Killer Joe. He creates a gravity that all the other performers can play off and against. I couldn’t help be beguiled by his performance, like a prey before a hypnotising snake. 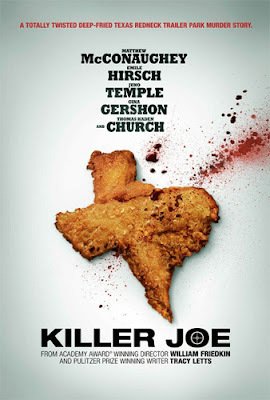 Killer Joe is another brutally brave and provocative work from William Friedkin but it will appeal more to a certain audience as it is as uncompromising in material as it is in format with the set pieces often very close to their stage origins. Which some may struggle with - preferring to be force fed a shiny gloss and neat CSI like wrap ups & graphics. Well the world of Killer Joe is shiny but it is more a glint off the gold plating of the seedy side of small town life that it portrays. It will leave you needing a shower after it slowly peels back the veneer of the American dream for this particular set of characters of which you are never sure which is the most tragic or malevolent. 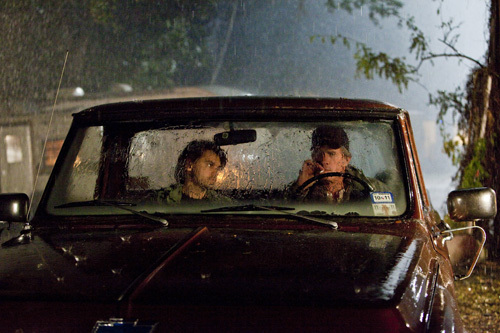 When small-time drug dealer Chris (Emile Hirsch) has his entire stash stolen by his very own mother, he plans to dispatch of her and cash in on her $50,000 life insurance to repay his debts. On recommendation he approaches Detective Joe Cooper (Matthew McConaughey), an enigmatic, dirty cop, who moonlights as a contract killer. Unable to get his usual upfront retainer, Joe sets his sight on Chris’ innocent sister Dottie (Juno Temple) as collateral for the job. But the simple agreement turns complicated when Dottie forms an unusual bond with Killer Joe and everything begins to unravel… Based on the play by Pulitzer and Tony Award winner Tracy Letts, "Killer Joe" is a controversial and shockingly cool black comedy thriller from cult director William Friedkin (The Exorcist, The French Connection), starring Matthew McConaughey, Emile Hirsch, Juno Temple, Gina Gershon and Thomas Haden Church.